The last lesson, despite a relatively straightforward one, was a very difficult one. While the examples seemed fairly easy, there might have been points which were overlooked. How would one know that “ba” was supposed to bond with “ja” in the same way a typical Devanagari letter would? How would one know when to put the second letter below the first letter? While “kka (k + ka)” has a form of two “ka” letters where was on the top and the other on top, why does “jja (j + ja)” produce a cluster with both “ja” letters side? Even more confusing is when a third letter is added to the jja mix, why does it resort to a form where the first “ja” is losing its “arm?” Unfortunately, there is no easy answer, but experience. Experience will be built, but this chapter requires solid memorization. Unlike Devanagari where there were a few exceptions, this chapter will be filled with letters and mixes that do not follow the general trend. 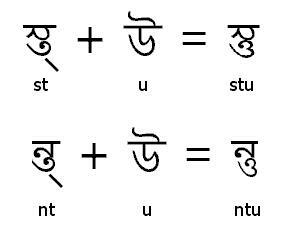 The first letter is the mix between “ka” and “ṣa” to form “kṣa.” Figure 6.1 shows “kṣa” in a very unusual form. Be sure to know this letter very well, because there is a letter that looks very similar to the next letter in our discussion. The letter that looks “kṣa” is the mix of “ha” and “ma” to form the letter “hma.” Notice the difference in the shape of kṣa and hma. Double “ṭa” almost adheres to the same process of stacking the letters on top of each other. The only difference is that the second ṭa is not really a ṭa. Figure 6.2A shows this. The letter “ta” has many exceptions in its formation of clusters. Let alone clusters, even the virama form is quite irregular. The last letter in our “ta” subsection is the mix between “ka” and “ta.” The form reminds us of “tta” with the right half of “ka.” This is very odd because “ka” is the first letter of the cluster, but it’s on the right. In addition, “tta” shape is used, even though it is just one “ta”, not two. Lastly, the mix of ṣa and ṇa requires special attention. The first half of the letter ṣṇa is a full “ṣa” character, with the “ṇ” take a strange form. Actually, it is a very strange mutation to form the right half of ña. When I studied Bengali in 2000, the first website I encountered was ukindia.com’s Bengali reading tutorial. 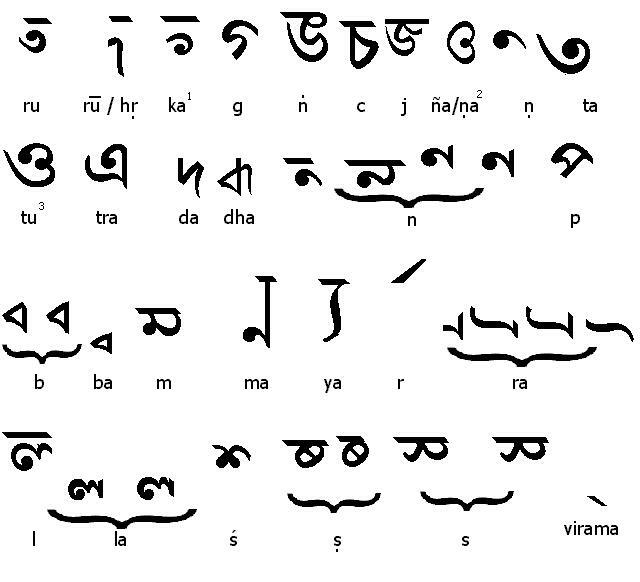 Through the help of that site, I develop the basis of being able to read Bengali. However, consonant clusters are indeed a challenge to master. After reading the Caitanya Caritamrta’s Bengali verses, I began to pick up the general forms of compounding consonants. A special table was made on that site. I modified it to be relevant to the last three chapters. Always note, there may be exceptions. 1: This form of k is used for kta and kra. 3: This form is tu for a consonant cluster with a full ta. This is not tta. 3. bhakti-yoga (devotional service) *use the “ja” form of ya. Try reading the words from Bengali script.